This entry was posted on 18th May 2018 by Chris Harle. The original intention had been to walk the Pennine Way over 2 or 3 weeks with my twin brother, however he was lured back into full time employment by the City of London Police therefore time off work became an issue. 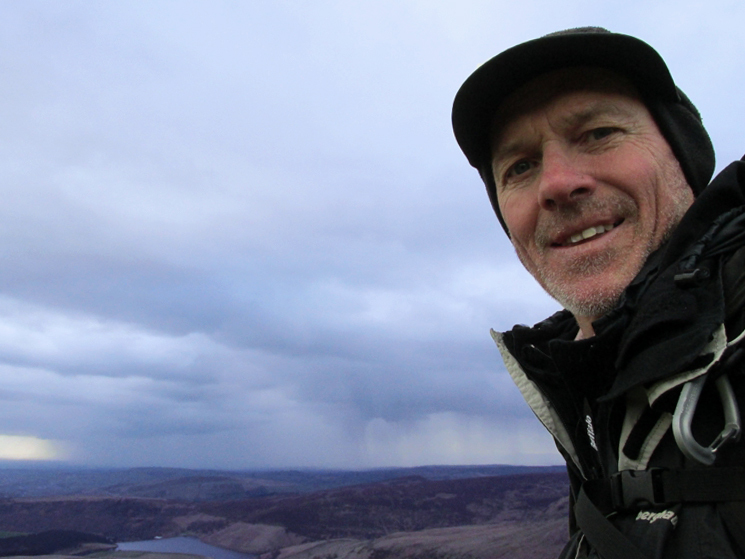 So, in stepped friend Steve Davis, who I had previously done a coast to coast sea kayak journey with in 2016. 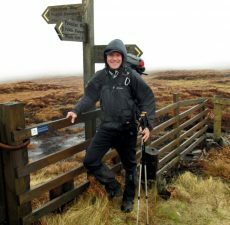 The walk now morphed into a more ambitious plan to complete the 260-mile walk in 10 days, whilst wild camping and with no support. We had several months to prepare, agree on equipment, discuss strategy and get fitter. My training plan had two parts including a weekly walk between 20 and 30 miles as well as a visit to my chiropractor every month to keep my back aligned. The training culminated in walking to work and back (a 30-mile round trip) when snow prevented me from using the car. A big thank you to Matt Pigden of Element Chiropractic in Belper for making sure my back was in great shape to take on the challenge. Due to the appalling weather and dire walking conditions we considered delaying our departure, but enthusiasm to get going regardless dictated otherwise. My wife Jane took us to our starting point at Kirk Yetholm near Kelso in Scotland. This is the finish for the vast majority of walkers (because all guidebooks describe it from south to north!) but I had an overwhelming urge to walk homeward to the Peak District and finish at Edale. 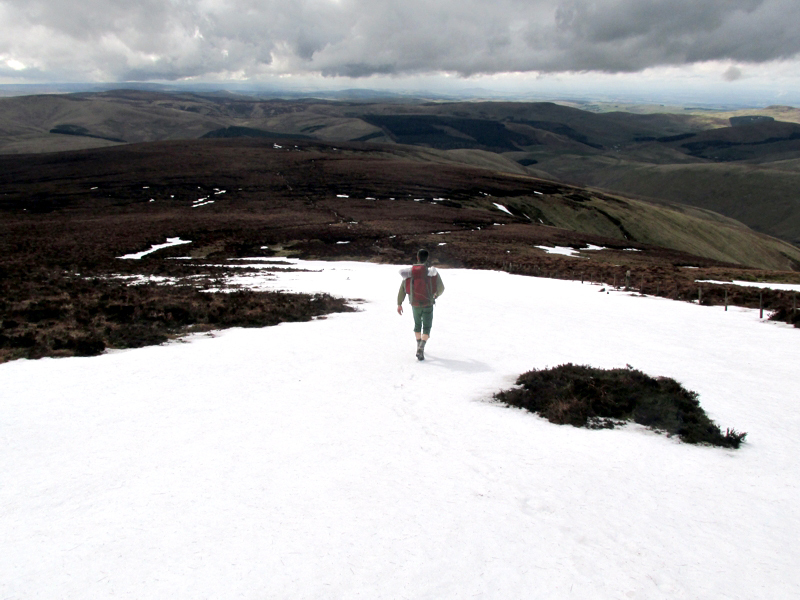 With typically British weather– we walked through snow one day and got sunburnt the next. One constant was a persistent cold wind and for most days five top layers was hardly enough. It did not take long to be reminded by people we met that we were going the ‘wrong’ way and this remained a constant theme throughout. The only minor disadvantage was that many of the PW signposts only pointed in a northerly direction and not the way we were going. 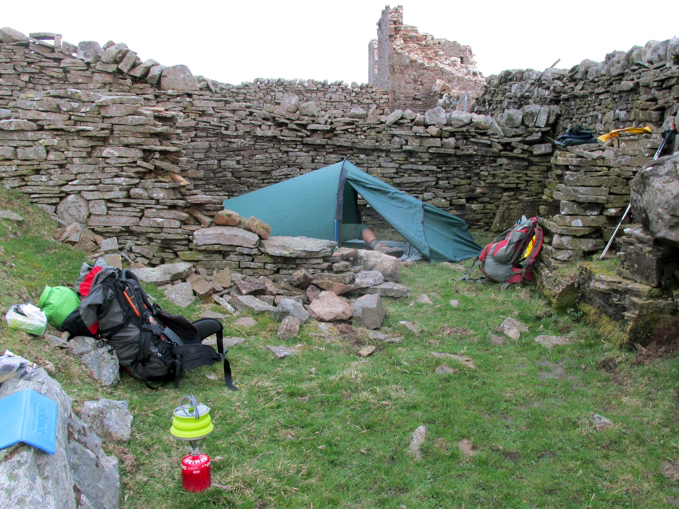 The main risk was finding a suitable place to camp at the right time. 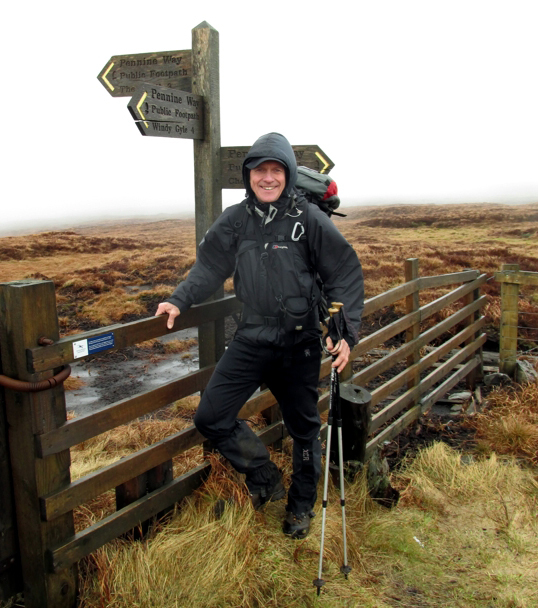 This is more difficult than perhaps you would imagine because much of the Pennine Way is wild exposed boggy moorland. However, providence was with us and just when it was most needed a walled enclosure or sheltered hollow would materialise. Research had revealed that shops were no more than two days apart, thus we were able to limit the amount of food and liquid that we needed to carry. Pot noodles and snack bars, supplemented by meals at four cafés and one pub – the remote and famed Tan Hill Inn (Great Britain’s highest pub at 1,732ft). 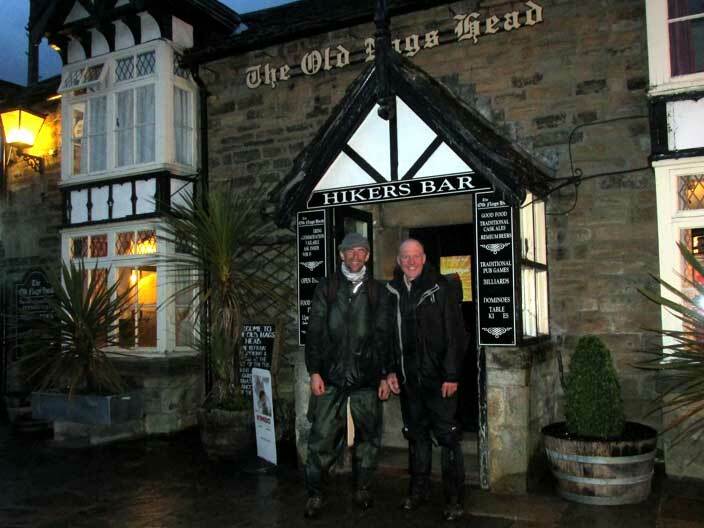 It was a surreal experience, having just waded through the mire of Sleightholme Moor, to step into the warm bustle of a pub serving traditional Sunday roast and offering entertainment from a comic Lancastrian duo. 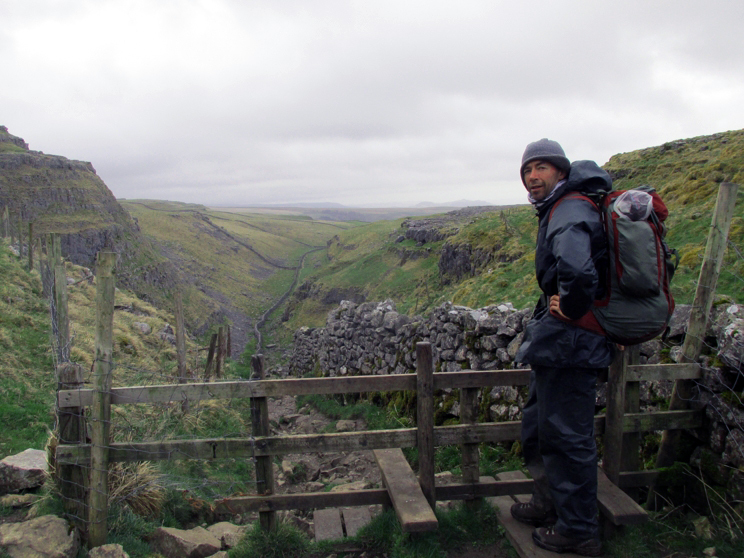 The Pennine Way is undoubtedly a magnificent excursion along the spine of England but perhaps the most lasting memory will be the people we met along the way. Without exception people were friendly, interested and encouraging. 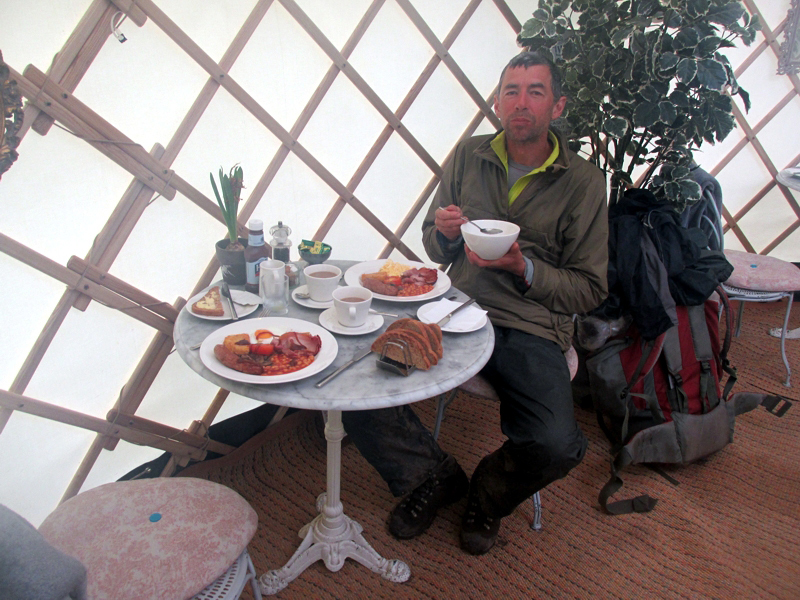 Particularly worthy of mention for their fantastic hospitality and service were Fountain Cottage Café in Bellingham, the Crossing Café at Alston station, Beck Hall Hotel in Malham and May’s Aladdin’s Cave Shop near Heptonstall. Some of the landscape highlights were the wilderness of the Cheviot, Hadrian’s Wall, Dufton’s High Cup Nick, Teesdale’s High Force waterfalls, Swaledale’s limestone scenery and of course the homecoming on Kinder Scout and its Downfall overlooking the Cheshire Plain and Manchester. A couple of wet nights convinced us that we did not want another so we put in a big effort to finish with the final long stretch across Kinder from Crowden. True to form as we approached Edale the rains came again but in the gathering gloom Jane was there to meet us and celebrate with a pint at The Old Nag’s Head. We now looked forward to getting back home for a lovely cup of tea and sleep. It took us 9 days 9 hrs and 30mins, averaging 28 miles a day, with packs of 12-14kgs (depending on how much food and water we had), starting at about 0530 every morning and finishing around 2030 (roughly coinciding with daylight hours). It proved a very enjoyable adventure, although it was a tough journey, remember that runners have done it in less than 3 days and that people of all ages do this long walk. All deserve credit for enduring the conditions and distance, however long it takes them. See below for a full kit list of what I carried and wore, for those interested. I’m not in the least bit embarrassed that some of the kit is quite old and dare I say it, not bought at Outside. However, my choice of equipment is tried, tested and trusted. I was keen to go as lightweight as possible but as you all know, everything is about compromise and of course, cost.